Refreshments: Goshawk, Mouldsworth; Manley Farm Shop, Manley; Linmere cafe and visitor centre. Outline: Through Delamere Forest Park: woodland tracks and paths, dappled shade, flooded mossland, hunting lodge, Pale Heights, panoramic views, Iron Age hillfort, medieval quarry, Roman road, turnpike tollhouse. 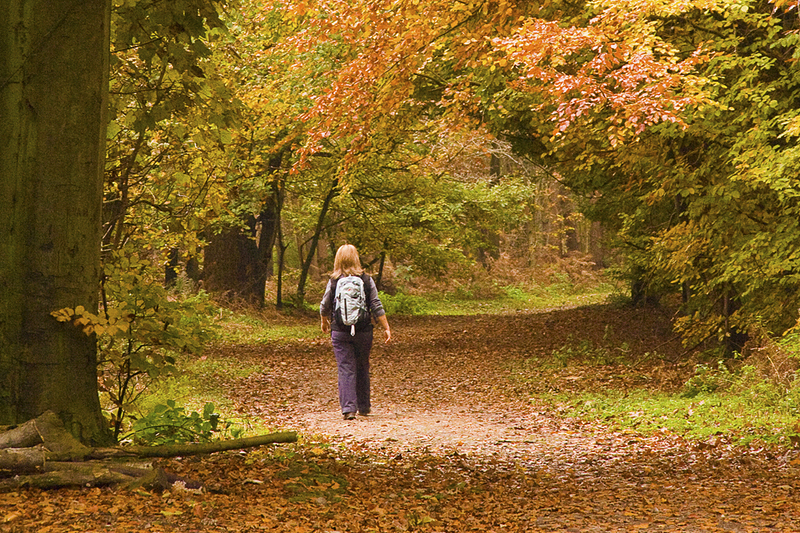 From Manley Common, the Sandstone Trail runs through leafy Delamere Forest. Modern Delamere Forest Park is all that remains of the once vast medieval hunting forests of Mara and Mondrem – where deer, wolves and wild boar roamed until they were hunted out in the 17th century. Today, the forest paths and tracks wind through mixed plantations of conifers and broadleaved trees, to pass the huge ink-black lake of Blakemere, busy with gulls and dragonflies in summer. There is a popular car park, café and visitor centre on the Sandstone Trail at Linmere, as well as a wealth of waymarked and colour-coded circular walks in Delamere Forest. The Sandstone Trail then rises onto Pale Heights with panoramic views over eight old counties from the modern stone circle and viewing platform on the summit. Nearby are the impressive ramparts and inturned gateways of Eddisbury hillfort, and the last traces of Watling Street, the old Roman road between Chester and Manchester. The Trail then descends through sun-dappled Nettleford Wood to the old toll cottage and car park at Gresty’s Waste on the main A56 at Kelsall. Ahead lies Primrosehill Wood, the quiet southern arm of Delamere Forest, Urchin’s Kitchen and the lovely sunken green lane called Sandy Lane.